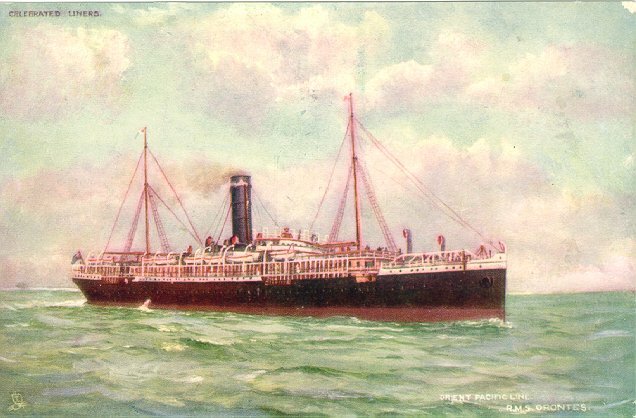 Orontes was built by Fairfield Shipbuilding & Engineering Co., of Glasgow, for the Orient Line. 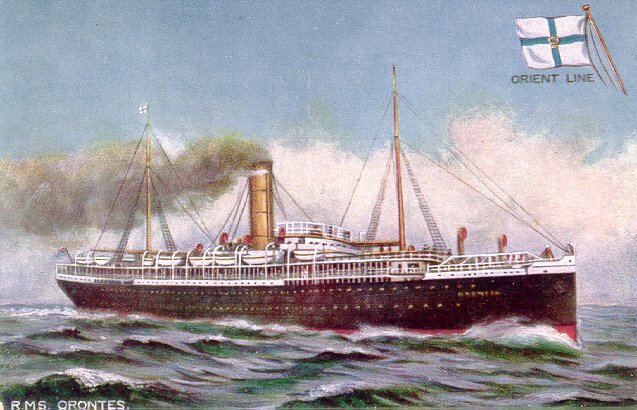 ("Orient-Pacific Line", which appears on this card, was a trade name in use between 1901 and 1906, to emphasize the close business relationship between Orient Line and Pacific Steam Navigation Co.) Orontes made her maiden voyage from London to Melbourne and Sydney, via Suez, on 24 October 1902. She served as a troopship during World war I, and resumed commercial service to Australia, including a new call at Brisbane, in 1919. Laid up in the Thames in 1921, she was sold for conversion into an exhibition ship in March 1922, and was renamed British Trade. Repossessed by Orient Line in August 1922, she was renamed Orontes. She was scrapped in 1926. Source: Haws' Merchant Fleets in Profile.